Help pay for growth and improvement of our Parish facilities. Paul J. Kim will be our special guest this Thursday January 23rd from 7pm to 9pm in the Parish Hall. Agradecimiento a Dios y a la parroquia de Nuestra Sra. de Loreto por 13 años de Servicio!!!! Click here to see what's happening at OLL. Join us at 9am for Thanksgiving Day Mass. You are welcome to bring the bread or wine or other dish from your Thanksgiving table to be blessed during the Mass. The entire Our Lady of Loretto Staff and Clergy wish you all a very Happy and Blessed Thanksgiving. ALL SAINTS DAY FRIDAY NOVEMBER 1, 2013 IS A HOLY DAY OF OBLIGATION. MASS TIMES ARE: 9:00am and 6:00pm in English and 7:30pm in Spanish. 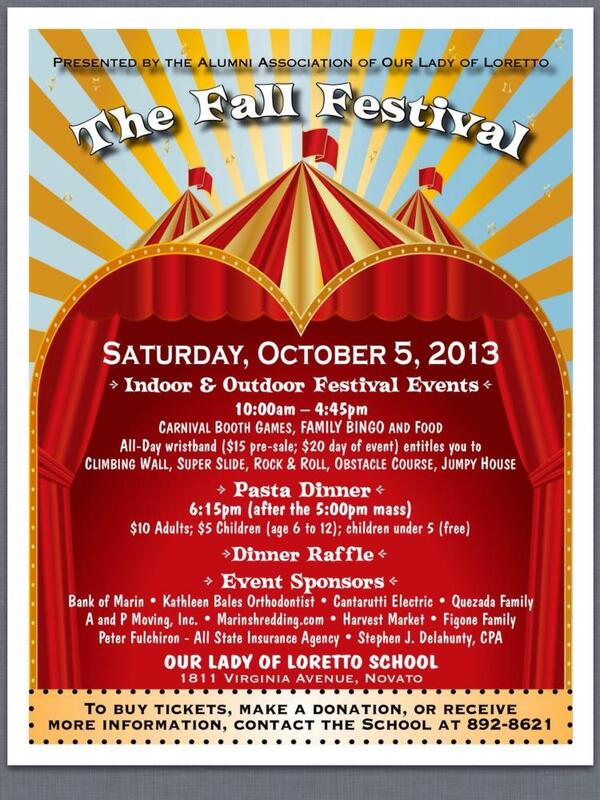 Fall Festival is today! Spread the word - all are welcome! Festival games 10-5, Mass 5pm, Spaghetti Dinner 6:15! Can't wait to see you there! The first day of school is always a very special day. Our first day was even more so this year as we blessed and dedicated our new Holy Family Statue. Pray for our Youth as they go on their pilgrimage to San Diego this weekend to attend the Steubenville Conference. Click to see a short video about the trip.